"Hail to the blue and white. We pledge our love to thee. With all our strength and might, we proclaim our loyalty. 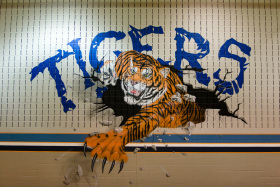 Our head held high with tiger pride. Our courage can't be tamed. In all we do we'll strive to honor and protect your name. Through all eternity in greatness may you rule. Scott Johnson Middle School." Scott Johnson was born and raised near Tioga, Texas. Following graduation from Collinsville High School, he attended North Texas State College and North Texas State University. He received his Bachelor of Science Degree in 1953 and his Masters Degree in August of 1957. Mr. Johnson's teaching certificates include the following: Principal and Superintendent, Secondary Health and Physical Education, Secondary and Elementary School Grades and Driver Education. Mr. Johnson began his teaching and coaching career in McKinney as a Junior High School coach and teacher. This was the beginning of a career that would span 35 years in the McKinney Independent School District. Johnson became assistant high school football coach and varsity basketball coach in 1960 and served in that capacity until 1967 when he was promoted to first varsity assistant football coach. Mr. Johnson became the Head Football Coach and Athletic Director in 1968 and served in that capacity until 1972 when he was named Assistant Superintendent of the McKinney Independent School District. His responsibilities included personnel and Federal Programs. 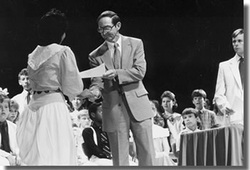 Scott Johnson became Superintendent of the McKinney Independent School District in the summer of 1980 and served in that capacity until his retirement in July of 1988. Mr. Johnson was an active member of the First Baptist Church of McKinney, McKinney Lions Club and many other professional and civic organizations. He is married to the former Jan Long of McKinney. They have two grown sons and four grandchildren. The Johnsons currently live on their farm near Lake Ray Roberts in Cooke County.